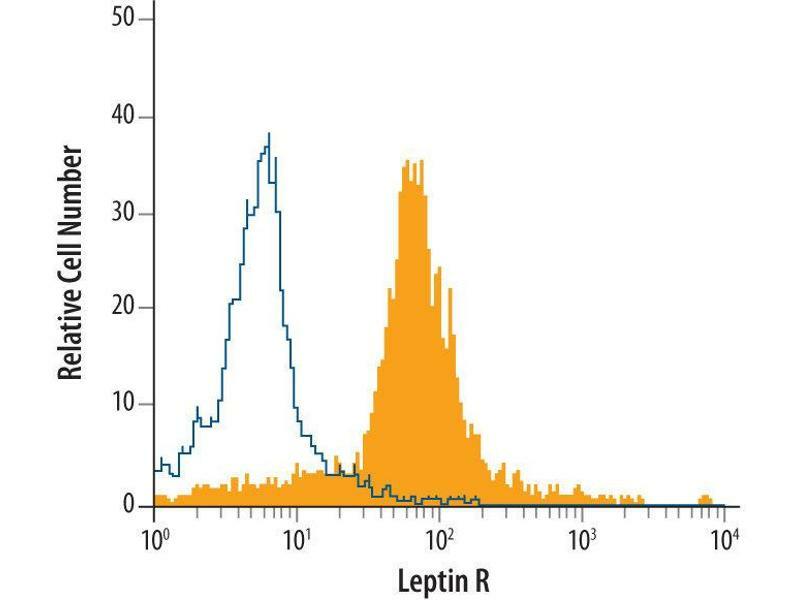 Detection of Leptin R in Human Monocytes by Flow Cytometry. Human whole blood monocytes were stained with Human Leptin R Monoclonal Antibody. 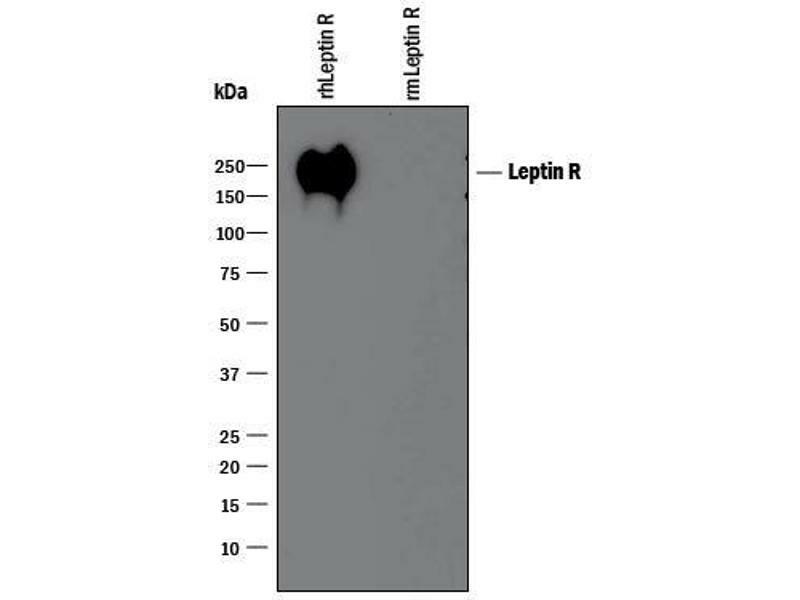 Detection of Recombinant Human Leptin R by Western Blot. 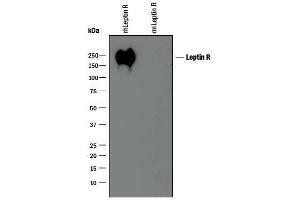 Western blot shows 25 ng of Recombinant Human Leptin R Fc Chimera. This experiment was conducted under reducing conditions. 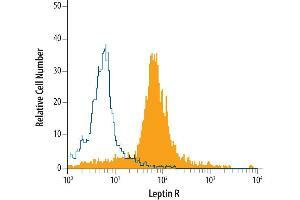 Specificity Detects human Leptin R in direct ELISAs and Western blots. In direct ELISAs and Western blots, less than 1 % cross-reactivity with recombinant mouse Leptin R is observed. Reconstitution Reconstitute at 0.5 mg/mL in sterile PBS. Liang, Gao, Liang, Ye, Peng, Zhang, Sharma, Su, Huang: "Normal leptin expression, lower adipogenic ability, decreased leptin receptor and hyposensitivity to Leptin in Adolescent Idiopathic Scoliosis." in: PLoS ONE, Vol. 7, Issue 5, pp. e36648, 2012 Method employed by authors: Western Blotting (WB) (Sample species: Human). Hongo, Watanabe, Arita, Kanome, Kageyama, Shioda, Miyazaki: "Leptin modulates ACAT1 expression and cholesterol efflux from human macrophages." in: American journal of physiology. Endocrinology and metabolism, Vol. 297, Issue 2, pp. E474-82, 2009 Method employed by authors: Western Blotting (WB) (Sample species: Human). Francois, Roper, Goodman, Pei, Ghumman, Mourad, de Perez, Perez-Perez, Tseng, Blaser: "The association of gastric leptin with oesophageal inflammation and metaplasia." in: Gut, Vol. 57, Issue 1, pp. 16-24, 2007 Method employed by authors: Immunohistochemistry (Paraffin-embedded Sections) (IHC (p)) (Sample species: Human).